ATTO's adaptive path optimization has built-in intelligence to sense when multiple paths to drives are available and direct I/O accordingly. For the cost of an additional cable, you can see up to a 70% performance improvement as well as eliminate single points of failure in your storage connections. 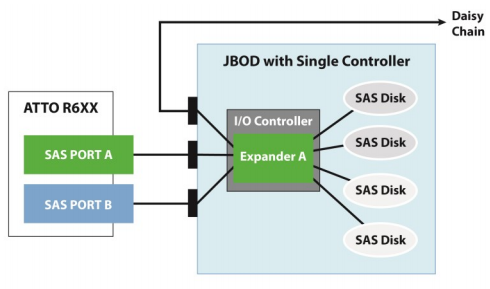 With this technology, the ExpressSAS RAID adapter automatically configures and reconfigures for optimum I/O balance and redundancy. Up to 2/3 of storage failures are caused by interconnect issues. For the cost of a cable, you get redundant paths to storage. Up to 70% faster than non-adaptive path optimized solutions. Fast, dynamic rebalancing minimizes disruptions and quickly restores a balanced configuration that delivers predictable performance. Scalable to work with cascaded arrays and expanders. Storage professionals are always looking for ways to increase performance and reduce downtime. Studies have shown that cabling and other interconnect issues cause up to 67% of storage availability challenges in the field. Eliminating instances where storage connectivity is lost due to single points of failure has a major positive impact on productivity. A "dual-domain" (for SAS drives) or "dual path" (for SATA drives) architecture creates redundant pathways from the computer to the storage devices. SAS drives have two physical ports, while SATA drives only have one. Because of this, dual-path provides redundancy between the server and storage while dual-domain provides redundancy all the way to the drive, including the storage controllers and expanders within. 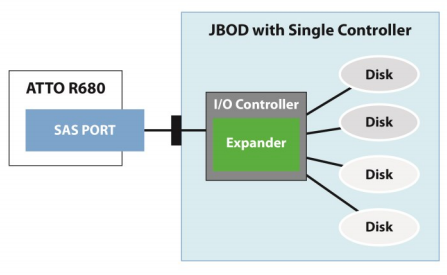 Not only does this reduce, or eliminate, single points of failure in your connectivity, it also provides for additional performance as there is now a second data path. Some competitive dual domain implementations are unpredictable and offer erratic results depending on the storage used. They are unable to balance the drives evenly across the redundant paths. These "solutions" can introduce latency and inefficiencies that adversely impact performance. ATTO Technology Inc.'s Adaptive Path Optimization has built in intelligence to recognize the fact that there are two paths to every drive, and will direct I/O accordingly. If a path to a controller goes down, or is taken off-line for maintenance, I/O will automatically be routed down the remaining path. If the path is restored, the adapter automatically reconfigures to send data down both paths. ATTO's products automatically sense the paths to the storage, configure primary and secondary access on disk-by-disk basis and balance I/O so that all paths are running as efficiently as possible. The key is in balancing the number of drives per path, otherwise known as the 'drive-to-PHY ratio.' Not all SAS/SATA RAID adapters are able to maintain this balance. Imagine a set-up with 24 drives connected with two paths. If path A handled 14 drives while path B sustained 10, the reponse time of path A would be longer, affecting overall RAID group performance. ATTO's Adaptive Path Optimization always assures the paths will be balanced. ATTO's Adaptive Path Optimization also works for larger configurations where multiple storage enclosures are cascaded using daisy chain ports. Since SATA drives only have one physical port, they do not support dual-domain. You can still improve performance and availability to the storage enclosure by using a dual-path architecture. Dual-path implementations require a storage enclosure with at least two ports and an expander. Here, the ATTO Adaptive Path Optimization algorithm recognizes that there are two connections to the storage and will automatically map half the drives to one port of the ATTO RAID adapter and half to the other. Have drives balanced across the paths evenly is even more important when using SATA as they are not as quick to respond as SAS drive to stall in the middle of a frame. If this happens, even for a few milliseconds, it will prevent the other drives on the same path from responding. In an unbalanced drive scenario, you will have more drives in your RAID group being starved which will result in addtional latency. Even if the drive is not stalling, it will take longer for the path with more drives to respond. The drives on the other path will be sitting idle, inefficiently waiting for the heavier path to catch up. Some storage enclosures support the use of SATA port multiplexors which sit in front of the drives to convert the single port SATA drives into dual port devices. This will allow SATA drives to be used in dual-domain architectures with dual expander/controllers. For the cost of a cable, you can see up to 70% performance improvement as well as eliminate single points of failure in your storage connections when using ATTO's Adaptive Path Optimization feature. All of this is managed automatically so that users can focus on revenue, not storage infrastructure. 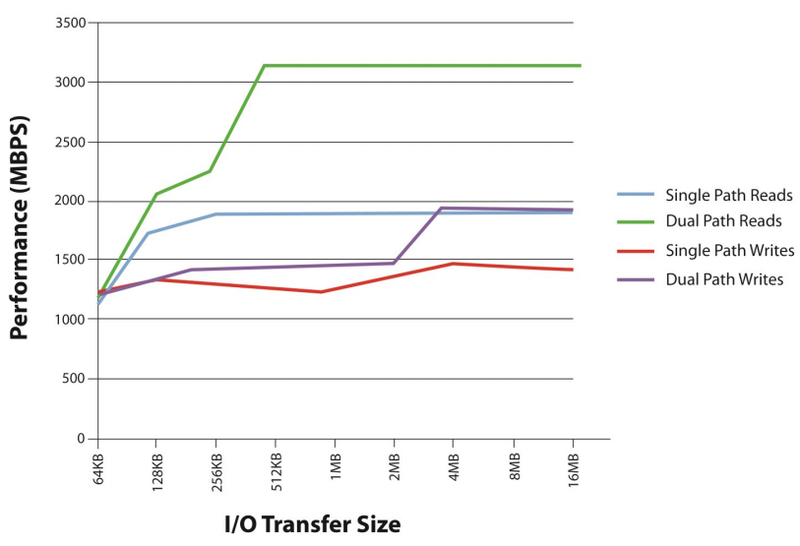 Benchmark comparison of single and dual path comparing read and write performance. Note 70% increase in read performance! Studies show that up to two-thirds of storage failures are caused by interconnect issues. For the cost of a cable, you get redundant paths to storage. Minimizes disruptions caused when components fail; quickly restores a balanced configuration that delivers predictable performance. Searching for paths and path flipping, common with other solutions, is eliminated. Evaluates RAID group elements and configures pathways that are reliable, fast and optimal-finding the best solution and reducing the risks associated with additional path failures. Works with cascaded arrays and expanders. 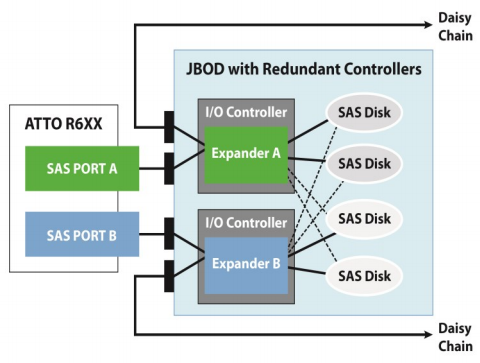 Both SAS and SATA storage benefits from Adaptive Path Optimization.